Marianna Bednarska is a young Polish percussionist. She graduated from Henryk Mikolajczyk’s percussion class at the Karol Szymanowski Secondary Music School (2012) and obtained her Bachelor Degree with highest mark from Marta Klimasara at Staatliche Hochschule für Musik und Darstellende Kunst in Stuttgart (2017). She is now studying for the Master Degree in Solo Music Performance under Philippe Spiesser in Haute Ècole de Musique in Geneva. 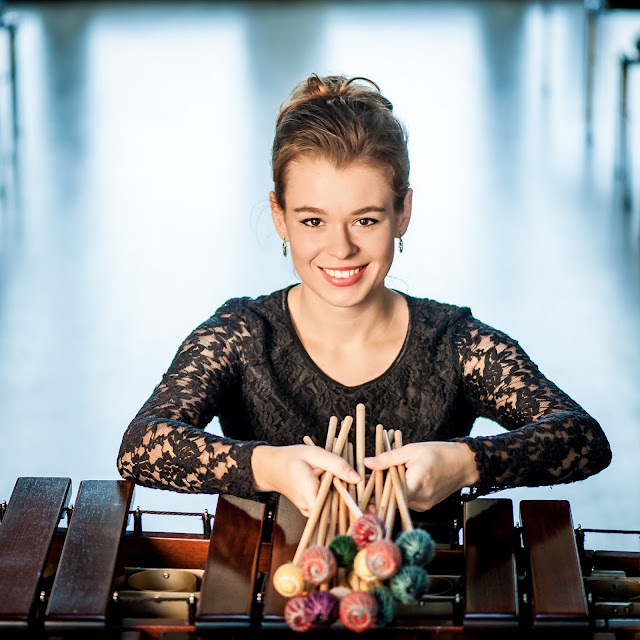 She won over 20 prizes in national and international percussion competitions, among others 1st Prize and the Special Prize at the International Percussion Competition at Northwestern (Chicago, USA 2016), 1st Prize and the Special Prize of the Bayerischer Rundfunk at the International Marimba Competition in Bamberg (Germany 2016), 2nd Prize and the Special Prize ‘Best Performance of a Belgian Composition’ at the Universal Marimba Competition of the Belgian Queen (Belgium 2017), 1st Prize at the International Marimba Competition in Paris (France 2009), 1st Prize at the International Marimba Competition in Fermo (Italy 2008) and 1st Prize and the Special Prize at the International Percussion Competition in Plovdiv (Bulgaria 2007). She was a finalist in the National Eurovision Competition ‘Young Musician of the Year 2009’. As a soloist, Marianna Bednarska performed in Poland, Danemark, Germany, Austria, Belgium, France, Switzerland, Bularia, Croatia, Italy, Ukraine and USA, also with orchestras such as Sinfonia Varsovia, Aalborg Symphony Orchestra, Sinfonia Iuventus, Polish Radio Orchestra, International Chamber Orchestra of Washington and Lviv Virtuosos. She received many important scholarships like Polish Government’s Scholarships, Sinfonia Varsovia Foundation’s Scholarship or Kunststiftung Baden-Württemberg. In 2013 Marianna Bednarska was awarded with the ‘Polish-Danish Friendship Prize’ for her close connection with Danish musical life, culminating in the CD recording of Anders Koppel’s four Marimba Concertos (DACAPO Records, 2014) which got extremely positive reviews, both in Poland and abroad (The New York Times, Gramophone, Deutschlandfunk, Fanfare Magazine).